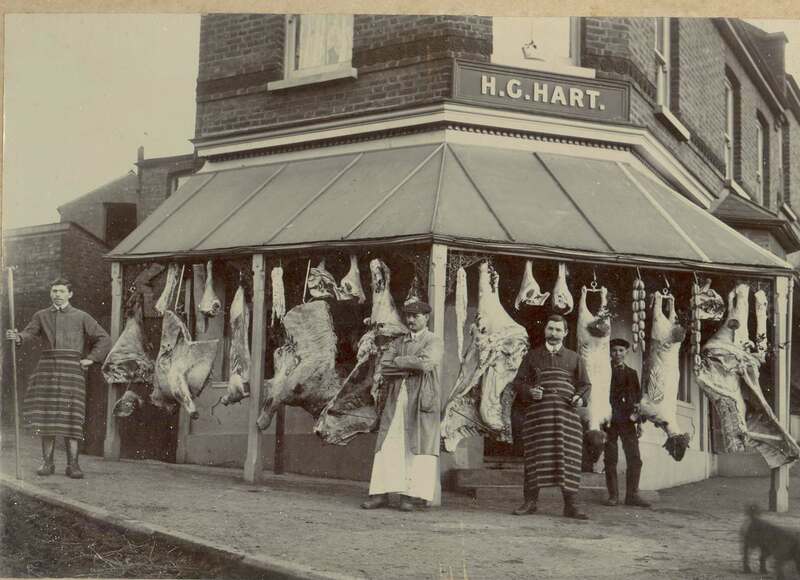 Harry George Hart had two butchers shops in Castle Point, one in Benfleet and the other on Canvey High Street. My family are the last Harts in this line, and we still live in Benfleet. I do not think we were related to the butchers in the photo, but we did live at 94 Thundersley road (Avondale house) until approx 1964 when the house was demolished to build houses in Golf Ride, my brother Roy was born in 1947 and I was born 1953. I have investigated my family tree back to 1790 and my immediate family are the last of this branch of the family tree and have all lived in Essex mainly Thundersley, Benfleet, Pitsea, Prittlewell, Ashingdon, Canvey and Little Baddow. Astonishes me how many people survived during those terrible unregulated days, not an expert in sight, and no health and safety concerning the moving of a hindquarter of beef and I wouldn’t be surprised if they used sawdust on the floors and for cleaning the blocks. I was wondering if the meat got a light dusting of smoke and soot as trains passed through. This shop was number 1 The Terrace, by Benfleet Station, it is still there but now a house and painted white. Have you got a brother called Neil? Can you imagine the health and safety police allowing all that meat hanging up outside the shop today?